On 30 July a gas pipeline near Ghislenghien in Belgium operated at a pressure of 70 bar ruptured following recent third party damage. Twenty-four people have died as a result and the last of 150 survivors, who were hospitalised, most with severe burns, has only recently left hospital. On the anniversary of the Ghislenghien disaster it is worth taking a serious look not only at the causes of such an incident but also at the steps that can be taken to avoid it. There are now more companies involved in digging holes across the UK than ever before. Latest estimates put this figure at around 4 million holes dug by utility companies annually and this excludes any excavations made as part of construction projects. Third party damage to underground services of all types continues to be a source of danger and financial loss to workers, members of the public, utility companies and contractors. When the underground service is a Major Accident Hazard Pipeline (MAHP) such as a high-pressure gas main or a petrochemical pipeline such as ethylene, oil or gasoline, then the consequences of a rupture can be devastating for people and the environment. In many ways Ghislenghien is atypical of third party damage incidents in the UK, which are often a result of roadside utilities work. However there are still important lessons to be learned. It is thought that damage to the pipeline occurred during the final stages of a car park construction project. This work had been notified to the Pipeline operator, Fluxys, and one of their operatives had regularly attended the site through the course of the project. Damage to the pipeline probably occurred as a mechanical soil stabiliser was driven over it or near by. This resulted in several evenly spaced (but not full depth) gouges in the steel wall of the pipeline. Two weeks after the completion of the car park gas pressure was increased in the pipeline, which then ruptured with the fault centred on a 350 mm long gouge. Other contributing factors to the accident may have been a reduced cover over the pipeline as a result of levelling, the way information was passed down the sub-contracting chain to workers and the frequency and adequacy of supervision by the pipeline operator at the site. Another example of third party damage leading to tragedy occurred at Walnut Creek in California in 2004. Five utility workers were killed when an excavator digging a trench for a new water main ruptured a high-pressure petroleum pipeline. The subsequent release was ignited by nearby welding on the water main. This incident occurred partly because the pipeline operator did not ensure that accurate location information was given to the water utility contractors and partly because of an over-reliance on that source of information. This highlights the need for contractors to take reasonable steps to verify for themselves the pipeline location information with which they are provided and to challenge it where necessary whether this information comes from the client or the pipeline operator themselves. The Walnut Creek incident also warns against using service drawings as the only source of information when other direct locating tools such as a Cat and Genny will give additional information on site. There are nearly 22000 km of MAHPs in the UK with 20000 km transporting gas above 7 bar, 1000 km transporting ethylene and the remainder transporting spiked crude oil, LNG and other hydrocarbons. Whilst these extensive networks are an efficient and low risk means to transport large quantities of liquids and gases around the country, there is considerable potential for third party damage to occur if excavation works adjacent to pipelines are not adequately controlled. In particular where the pipelines enter urban areas or are sited near to communication routes this potential rises sharply. The photograph above of an ethylene pipeline shows the kind of damage that can be caused when a 360-degree excavator is used inappropriately. The UK Onshore Pipeline Association’s (UKOPA) Pipeline Fault Database covers pipeline loss incidents from 1962 to the present day. UKOPA exists to provide the recognised and authoritative view of UK pipeline operators on strategic issues relating to safety management, operations and integrity management of pipelines. UKOPA has an obvious interest in reducing the incidence of third party damage to the UK pipeline networks since aside from the potential for death and injury to workers and members of the public that these incidents provide they also represent a significant cost to its members. The database shows that the amount of product loss per 1000 km has been falling steadily since the early 1970s. 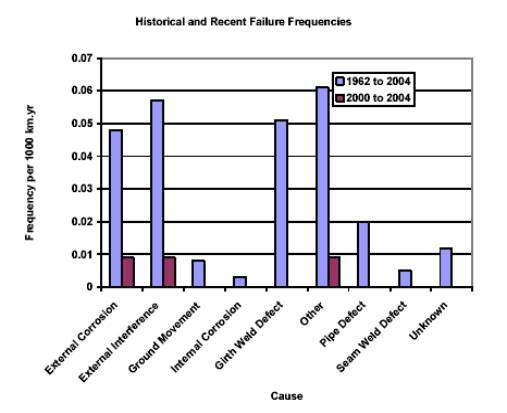 Despite this third party damage (or external interference) remains the largest single cause of damage and product loss to pipelines in the UK as the graph below shows. Regular maintenance and upgrading of the UK’s MAHPs has revealed instances where damage has occurred to pipelines but has not been reported to the operator. UKOPA believes it is essential for all cases of damage to be reported to the operator immediately. This applies even in cases where only the pipeline coating or surface appears to be scratched as this can lead to corrosion and a weakening of pipeline integrity. HSE’s guidance booklet HSG47 "Avoiding Danger from Underground Services" provides general advice to those carrying out excavations. National Grid Transco have produced more specific guidance for their own high-pressure network entitled "Safe Working in the Vicinity of Transco High Pressure Gas Pipelines and Associated Installations" (reference SSW22). Always check for the presence and location of pipelines before the start of any construction or utilities work. If in any doubt always contact the pipeline operator. 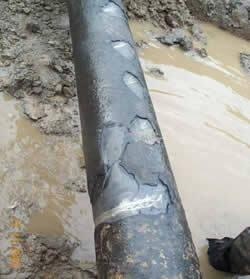 If a pipeline is known to be present contact the operator as soon as possible and arrange for an on-site assessment. This is best done at the design stage so an informed discussion on design, working practices and use of equipment can take place. Take reasonable steps to verify any pipeline location information given to you and don’t rely on it alone. Make sure everyone involved in the work understands the importance of avoiding pipeline damage and of reporting any near misses, especially if it involves surface or coating damage to the pipeline. "Don’t take a risk with your life, or the lives of others. Always know what you are digging into – if in doubt, don’t dig !." Author: J Stancliffe, HSE. HSE is a member of the United Kingdom Onshore Operators' Pipeline Association (UKOPA) third party damage working group.